hey everyone! Big news. I'm a Grandma! 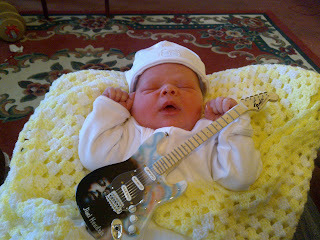 Stephen and Belinda are now the proud parents of baby Riley (see Rock Kid above) who was born on June 26th. All is well, he is gorgeous and I'm in lurve! He weighed in at 7lb 2 oz and is a happy little man. Can't remember anything else at present so will leave Riley as the star attraction. Not surprized your in love. Congrats! BACK FROM SAILING THE SEAS!